A pilot pathway and guidelines to assist primary care practitioners managing patients with headache was introduced by the West Norfolk Clinical Commissioning Group (WNCCG) after GPs had expressed a wish to have greater access to imaging. The pathway, which included GP access to MRI (GP-MRI), provided guidelines as to who should not be referred for scanning, but rather admitted or referred urgently i.e. “Red Flags”. 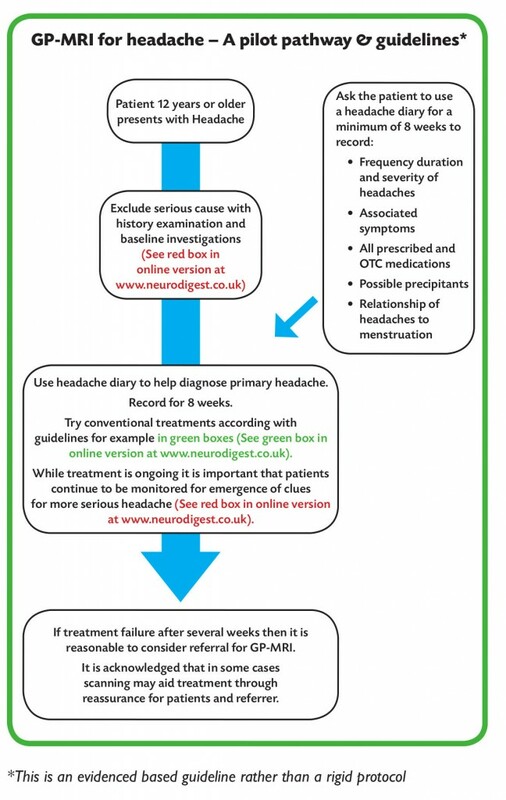 It grouped the “Green flag” patients with primary headache into categories, to aid diagnosis, provide evidence based treatment plans and guidance as to which patients were eligible for GP-MRI. The pilot was preceded by a well evaluated educational programme provided by the authors of the pathway. 12 months following access to GP-MRI there was a 29% reduction in headache referrals to the neurology department. Headache is the most common new neurological symptom presented to General Practitioners and to Neurologists. However only 3% of headache consultations are referred to secondary care. Headache is the reason for up to a third of new neurology referrals from General Practice. In 2011-12 it was the reason for 24% of referrals from West Norfolk GPs to the department of Neurology, Queen Elizabeth Hospital, Kings Lynn. Headaches presenting to GPs are most commonly migraine and chronic tension headache and it has been suggested that most primary headache can be managed in General Practice. However, primary care health professionals find the diagnosis and classification of headache difficult, and both health care professionals and patients worry about serious causes such as brain tumours2 despite the fact that when patients present to their GP with headache the risk of brain tumour is 0.09%(2). The decision to investigate headache depends on a number of factors including therapeutic value, clinical confidence, time constraints in the consultation, availability of imaging, the GP’s approach to risk and uncertainty, reassurance of an anxious patient and medico-legal concerns. Primary care access to imaging has been shown to reduce referral rates in chronic headache (3,4,5). The findings of a study in Nottingham suggest that a defined access pathway for imaging to investigate chronic headache preceded by a GP educational meeting and clear MRI reporting for non-specialist referrers can be deployed appropriately in a primary-care setting (6). At a clinical commissioning engagement meeting (held on 9/2/12) West Norfolk GPs expressed the desire to have access to imaging to investigate headaches. Preliminary discussions with the local Neurologists in Kings Lynn revealed their concerns that providing GPs access to MRI may lead to delay of acute diagnoses such as subarachnoid haemorrhage, arterial dissection, meningitis and giant cell arteritis. These patients needed to be admitted or referred urgently and not referred for scanning. An additional concern was the risk of doing harm to the patient by discovering “incidental findings” on the MRI and thereby causing anxiety. Incidental findings on brain imaging may be found in 0.6-2.8% of the population. The radiology department was concerned about the potential for a large number of MRI requests. The (WNCCG) commissioners were concerned about duplication, overspend of resources and the importance of prescribing within the local guidelines. A working group consisting of General Practitioners, Radiologists and Neurologists met to devise a headache pathway and guidelines including access to MRI. 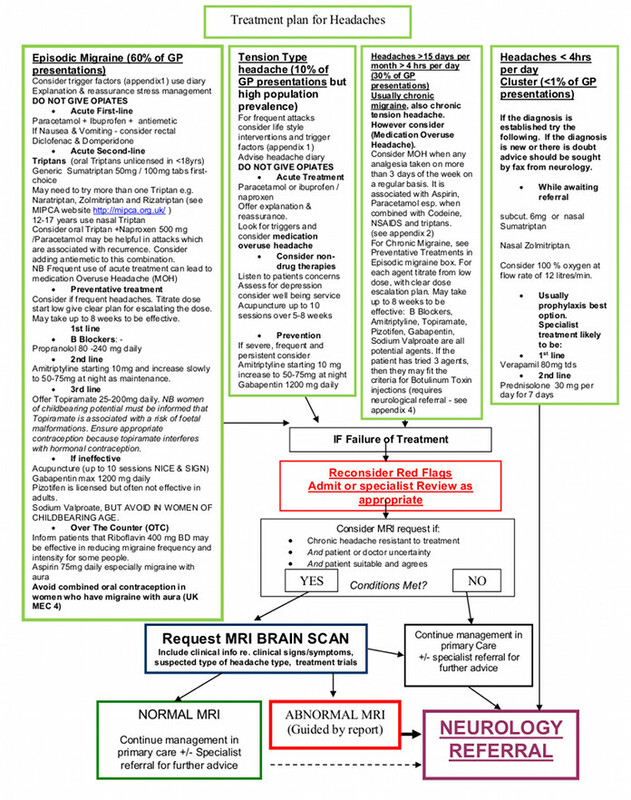 The pathway provides guidelines as to which patients need admission or urgent referral and those with chronic headache who may benefit from MRI referral. Normal investigation does not eliminate the need for follow up and appropriate management. It is estimated that 60% of patients presenting to General Practice with headache have migraine. Accordingly it was agreed that the pilot pathway should also contain guidelines regarding the management of headaches.Advice was provided by the Director of Headache Services at Kings College Hospital London. The Community Pharmacist collaborated with the WNCCG medicines management team, to ensure the pathway treatment plans were in keeping with locally agreed prescribing guidelines. Subsequently a business plan was drawn up with the Commissioning Manager and agreements were made regarding neurology tariffs and the costs for GP-MRI. A GP-MRI electronic request form was designed including contraindications to MRI for referrers. GP-MRI reporting was to be undertaken by General Radiologists in a suitable GP-friendly fashion. Thus, when incidental findings were detected, explicit guidance would explain their relevance. Monitoring of both GP-MRI and neurology referrals was undertaken by the operations manager of the WNRMC. All 23 practices in the West Norfolk Clinical Commissioning Group (WNCCG) (population 164,500) were to be provided with access to MRI for refractory headache. This access was linked to an educational programme to launch the pilot pathway. The Neurologists and Radiologists insisted that a representative from every practice attend the educational meeting, to ensure that patients were referred according to agreed criteria. A meeting was held on the 4/7/12 organised by the GP tutor. Every GP was invited and all practices were sent the proposed pathway. The evening 2 hour 15 minute meeting consisted of 5 presentations followed by questions and answers. A second afternoon meeting with a similar format was held on 21/3/13, to ensure that remaining practices were represented.The pilot was launched on the 1/4/13. The headache pathway and guidelines were launched on 4/7/12 at an educational meeting, and by electronic distribution of the pathway to all WNCCG GPs. It was originally planned that access to GP-MRI would commence at the same time.However due to contractual problems access to GP-MRI was delayed by eight months, finally launching on 1/4/13. The results of 22/23 practices (population 163,821) who used the Choose and Book system. There was a reduction of headache referrals from 335 in 2011/12 to 299 in 2012/13, and 237 2013/14. This represents a 29% reduction compared with the 335 referrals in 2011/12. There was a reduction of headache as the reason for referral to neurology as a proportion of total neurology referrals from 24% to 21% to 18% over the same period. 12 months after access to imaging there had been 36 referrals for GP-MRI. 2 patients failed to attend (patients offered 2 appointments). The condition of 1 patient altered after the GP-MRI had been requested and that patient underwent urgent CT scan after discussion with the radiology department. Of 33 patients who underwent GP-MRI, there was only 1 abnormal result, a possible normal pressure hydrocephalus. There were 32 normal results, which included 9 incidental findings (27%). 1 type I Arnold Chiari malformation. Three of 33 patients who underwent GP-MRI were referred on to the neurology department. One patient with possible normal pressure hydrocephalus was referred directly as a result of GP-MRI. The other 2 patients were referred for further advice on the management of their persistent headaches.They had incidental findings on their GP-MRI (cerebral atrophy and pineal cyst). The overwhelming support for this project from constituent GPs was demonstrated by their attendance at educational meetings, their evaluation of the pathway, and their willingness to participate in the pilot. The reduction in referrals in the first year would seem to be attributable to the educational meeting and distribution of the pathway.The reduction in the second year would appear to be a combination of the pathway and access to imaging. Overall there was a 30% reduction in headache referrals to neurology, while referrals for other neurological complaints over the same period remained static. The concerns about increased cost and increased demand for MRI were not realised.The discovery of incidental findings on MRI (27%) were offset by appropriate radiological reporting.The pathway is an example of worthwhile clinical commissioning by demonstrating the benefits of GPs working with Neurologists for training and support, (as proposed by the RCP 7) as well as Radiologists, Commissioners and Community Pharmacists. The overall reduction in neurological referrals suggests its cost effectiveness. It is proposed that GPs should continue to have access to GP-MRI according to these guidelines. There is a need for continued data collection to ensure referrals continue to be made in accordance with the guidelines and quality of patient care is maintained. Dr Phillip Koopowitz and Alison Lowe, Chairman and Operations Manager respectively, of the West Norfolk Referral Management Centre for their assistance with the data collection. Neil Bindemann of the Primary Care Neurology Society for introducing KR to AD and for his encouragement. Dr Hilary Lazarus for her help with the manuscript. National Institute for Health and Clinical Excellence. Headaches. 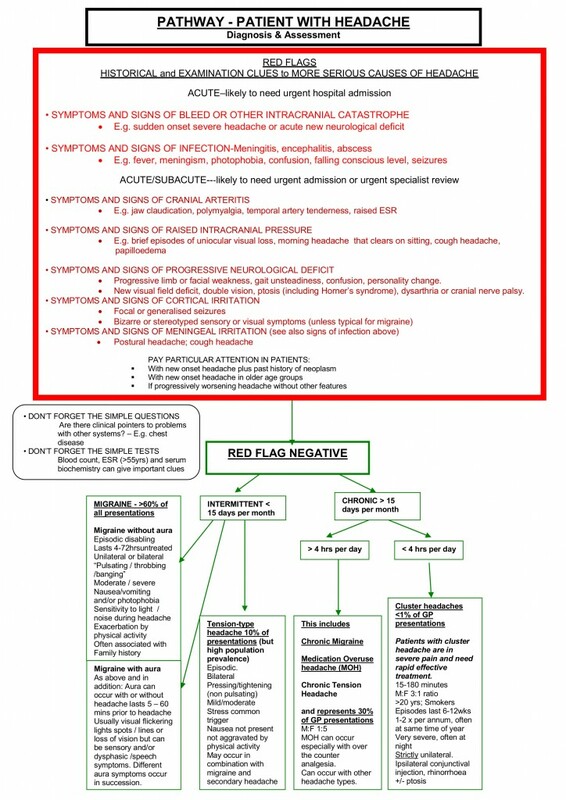 Diagnosis and management of headaches in young people and adults. (Clinical Guideline 150.)2012. http://guidance.nice.org.uk/CG150/ Guidance. Department of Health. Direct Access to Diagnostic Tests for Cancer. Best Practice Referral Pathways for General Practitioners. DH; 2012. Howard L, Wessely S, Leese M, Page L, McCrone P, Husain K, Tong J, Dowson A. Are investigations anxiolytic or anxiogenic? A randomised controlled trial of neuroimaging to provide reassurance in chronic daily headache 10.1136/jnnp.2004.057851. J Neurol Neurosurg Psychiatry 2005;76(11):1558-1564. Thomas R, Cook A, Main G, Taylor T, Caruana E, Swingler R. Primary care access to computed tomography for chronic headache. The British Journal of General Practice. 2010; 60 (575): 426. Taylor T, Evangelou N, Porter H, Lenthall R. Primary care direct access MRI for the investigation of chronic headache. Clinical radiology. 2012; 67 (1): 24–27.